To make the inclined conveying effective, it is essential to team up flat conveyor belt with the cleats, however the strong adhesion of the cleats is a decisive for the successful conveying of the product at certain inclination and for that what one requires is the promising conveyor belts with cleats that can improve incline conveying and ensures effective material handling. This cleated conveyor belt has solved several problems associated with inclined conveying and has augmented the capability of the respective industry to carry heavy load at different angles of inclination. However, sterling quality of the belt is essential to make the inclined conveying effective abreast affordable for the all types of industries. With a motive to provide the matchless alternative for the inclined conveying needs, we bring forth the brilliantly designed and developed range of the cleated conveyor belt, a belt that is fabricated employing the tested quality PVC/PU material in order to leverage the bountiful advantages of the respective polymer and present completely sturdy, durable and low cost range of the cleated conveyor belt that can outperform under harshest environmental conditions. The cleats in the offered conveyor belt is fused by means of the hot vulcanization technology that ensures strong bonding that outlive and ensures spillage free conveying of the respective material throughout the life. 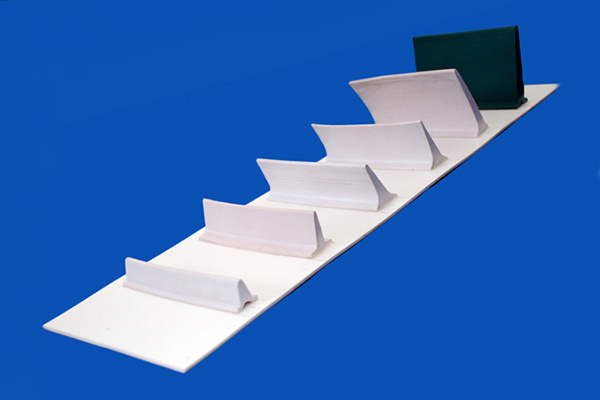 The technological expertise in conjunction with the adherence to the ISO quality regulation is a reason for the high quality of our cleated conveyor belt, whereas sustainability against high temperature, abrasion, tear, corrosion, chemical and oil is because of the PVC/PU material used in the construction of the conveyor belt, making it ideal match to effectively convey powdery to lump sized products effectively. The cleat incorporated with the conveyor belt is available in different shapes (T cleat, V guide, scoop cleat, flanges) and sizes to accomplish specific conveyor need successfully. Moreover, we as a manufacturer cleated conveyor belt is savvy enough to design and develop customized cleat as per the angle of conveying and also to fuse on any type of conveyor belt. You share your area of application; we will customize it to flourish your conveying operation. The comprehensive range of our cleated conveyor belt is renowned in the market for fulfilling highest quality standards and also food grade standards, is used extensively to convey every type of load efficaciously, best for grains, vegetables, fruits, small automobile parts, mining, detergent, cement, dry fruits and granules and powdery form materials.